Ponds are a great way to make the most of your garden and add a great feature to it. It is well known that water, especially running water, has a relaxing and therapeutic effect but with all these wonderful benefits ponds can also have some problems. We won't try to address all the problems you might run into with a pond but we will try to help with your problems specific to water. 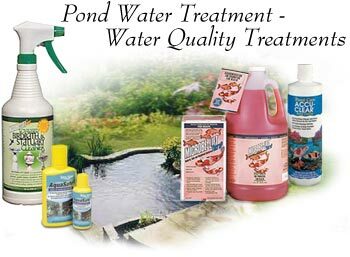 Get your pond water treatment kits and chemicals from Pond Pals at Hemphill's Garden and Aquatic Center today! We carry many pond accessories, including pond beaded filtration, AP Pro Pond, Argent, Barley Bales, Carefree, Clear Pond, Crystal Clear, Green Clean, Hikari, Jungle Pond, Kordon, Laguna, Little Giant, MicrobeLift Mosquito Dunks, New MicrobeLift, Pond care, PondMaster, Pond Perfect, Pond Test Kits, Tetra Pond, Ultra Clear / PondPals.com. Call us at 410-803-1688 for water treatment kits and chemicals. The biggest problems for most ponds are leaf debris and a proliferation of algae. If vegetation falls into the pond water and decays the process of decay uses the oxygen in the water and releases carbon dioxide. This means that if large quantities of vegetation enter your pond then enough oxygen can be removed to cause the pond's wildlife to suffocate. Algae is also caused by decaying vegetation, the reason for this is the nitrogen which is released during the decay process is soluble in the pond water. Nitrogen is a nutrient that is essential for plant growth and if there is a lot of it the water then it will normally result in algal bloom. To combat these problems you can take a number of steps. One of the first things you should do is consider fitting a net if there are a lot of leaves getting in to your pond water and take care to remove the leaves at regular intervals especially during autumn. You should also consider fitting a fountain to your pond this will help to put oxygen back into the water. Be careful to ensure the pump is not clogged up by the debris in the pond if it is in a bad state when you fit the fountain. You may also like to look into more natural methods of increasing the oxygen content of your pond and introducing plants like Elodea Canadensis and Potamogeton Crispus during April or early May which can help to compensate for the oxygen lost during decomposition of the debris in to pond water. For combating the proliferation of algae you can either look in to a UV filter solution which is good for the long term but if you have time to spend on your pond you could also remove some of the decaying vegetation from the base of the pond, taking care not to accidentally discard any good organisms like frogs and snails. As with algae green pond water and blanket weed can occur in new ponds when most of the water has come from the tap and is high in nutrients like phosphates and nitrates. To combat these problems you can take mainly the same methods as above; biological filter can also be used to combat blanket weed and a UV filter can be used to combat green water effectively. Of course applying netting to the pond's water and clearing debris will also help to reduce the nitrogen content. It is also important not to put too much tap water in the pond's water system.